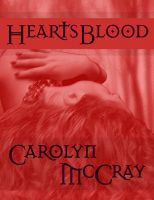 Books HeartsBlood by Carolyn McCray: Blog Tour de Force Begins! HeartsBlood by Carolyn McCray: Blog Tour de Force Begins! Carolyn McCray is your very first author on the Indie book Collective’s Blog Tour de Force. From the clever pen of Carolyn McCray comes a paranormal adventure with a devastating romance that will leave you stunned. In HeartsBlood, McCray takes us to the beautiful city of San Francisco; from the gorgeous panorama of the Golden Gate Bridge, the lush and dense beauty of Golden Gate Park, to the bleak starkness of Alcatraz, McCray tells a story that will test the very boundaries of both your beliefs and disbeliefs in science, magic, and love. Salista Calon is an emergency room doctor at the San Francisco General Hospital. Headstrong, dedicated, and practical, Sal believes in science and the logic that it brings. With a promising career ahead of her and engaged to a successful, respected, and handsome clinician, Sal is firmly entrenched in the world of reality. Until one night of horrific tragedy changes her life and her perceptions of the world around her forever. Tyr Deadblood is a hunter and warrior from another place and another time; he is also a talented wielder of a magic known as Praxis. He is a man who’s purpose in life is to put an end to anything that disrupts the balance of existence. He is also a man who’s lineage is disdained, and his very existence is an abomination to the very people he is honor bound to protect. He is also haunted by a past of his own making that still has the power to torment him. Tyr comes to Sal’s world to vanquish a terrible enemy, a creature that is killing innocent people. It is a horrendous creature consumed by hatred, searching for the power that it needs to destroy the worlds. Thrown together by danger, Sal and Tyr must work together to destroy a rabid beast that is literally consuming the memories of victims and bleeding them dry. Sal is challenged to believe that magic is the only way to destroy the beast, and that magic lies in the very essence of the blood that courses through the veins of man, woman, and child; if only she can discover how to harness it. Yet can Sal come to terms with the existence of magic in her world of science? And can she do this before the beast that hunts both herself and Tyr for the power of their HeartsBlood succeeds in destroying them? Devastated by betrayal and death, Sal struggles to believe the reality of having Tyr in her life and the new world he has awoken her to. She bravely throws herself into danger to aid Tyr, but is she brave enough to surrender to love and risk the chance of losing it? Torn between duty and loyalty, Tyr must choose between honor and the woman that he loves. No matter the danger that lies ahead, Sal and Tyr test their bond, hoping that love will prove to be the strongest power of them all. Right out of the gate, I knew that this book would challenge me to believe in the possibility of magic and the impossible. Is it possible to alter reality simply by using the mantra of mind over matter? My heart raced just knowing there was a paranormal terror on a rampage through San Francisco. Terror, intrigue, and magic became par for the course in this thriller. HeartsBlood is a unique, fast paced paranormal tale with an original storyline and a shocking twist of an ending that will leave you breathless. HeartsBlood is available for download at Amazon and Smashwords! authors, Blog Tour de Force, blogging, Books, good reads, Indie Book Collective, Paranormal, romance, thriller. Bookmark. Blog Tour de Force Kick Off!